If you, like me, are in the habit of browsing eBay for cheap electronic bits and pieces, you may have stumbled upon this ridicuously cheap STM8 board (eBay, AliExpress). How does it compare with Arduino? 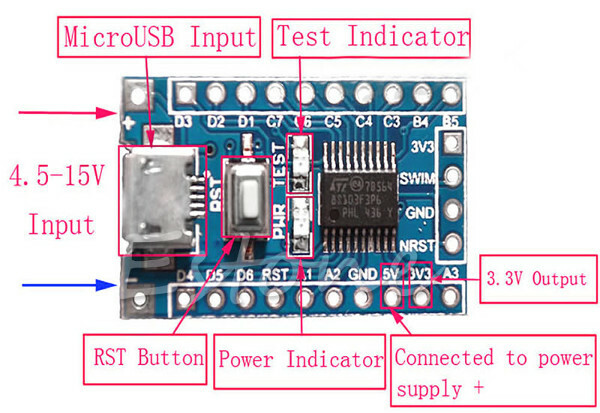 In this post, I'll present my initial findings about the mysterious microcontroller and the board it comes on. If you're so inclined, the chips can be purchased separately as well. First a TL;DR for the impatient: It's an inexpensive, low-specced 8-bit microcontroller manufactured by ST, which could replace the Arduino/ATMEGA in simple applications. 8-bit microcontrollers have been around for a very long time, slowly fading in popularity as more powerful devices pushed them out of the spotlight. However, they never really went away. The notorious 8051, for example, is still very much alive and kicking, partly because its copyright expired and it's now fair play to clone it and build into whatever design the manufacturers please. Other families appeared over the years, but the real boom of the 8-bit came with Arduino and the whole "DIY hacking" phenomenon. You're no doubt familiar with Atmel's AVR line or Microchip's PIC. AVRs, popularised by the Arduino project, and PIC's, because of their low cost and Microchip's eagerness to provide free samples, have dominated the hobbyist market, and kits and accessories for them have became a serious business (look at all those "Arduino modules" on eBay!). It comes as no surprise that other chip manufacturers wanted their slice of the cake. One of those efforts apparently crystalised in ST Microelectronics' STM8 line. You may know the company as a generic semiconductor manufacturer, and they're also behind the popular STM32 line of Cortex-M microcontrollers (also cheaply available on eBay). STM8 haven't really gone mainstream, but for whatever reason, they's now cheap and widely available. Some variants of STM8 are used in automotive applications, but not the STM8S family we'll focus on. Arduino and it's clones are predominantly built on AVR's, commonly the ATMEGA328P. It runs at 16 MHz and has 32kB of FLASH, 2 kB of RAM and some EEPROM. There's also the obligatory mix of peripherals, like timers, UARTS, SPI and I2C. The STM8 chip we'll look at, STM8S103F3, has a similar set of peripherals, but a substantially smaller memory space (8 kB FLASH, 1 kB RAM). It may not be able to replace the ATMEGA everywhere, but at the low cost, it well might in many places, and it makes it viable to literally embed it in places you wouldn't even think of with more expensive devices. A "SPI to Neopixel" interface for 60 cents? No problem! The ATMEGA has one unpleasant flaw in it's architecture: the Harvard memory design. FLASH and RAM share the same address space in an overlapping manner, maybe to save some address bits, so the same address can be in either of them. This is where your bothersome pgm_read_byte() and friends come from—it needs a special assembly instruction LPM to read data from FLASH. Not even the high level abstraction of avr-gcc will shield you from this problem. You'll face a similar problem with the EEPROM, but that could be excused as you won't it so often. The STM8, possibly inspired by the STM32, appear as von Neumann, in that both memories are mapped to one linear address space with no overlap. Internally there are two buses, but it's handled transparently. As a result, you can seamlessly store your constants in the program memory and even run code from RAM. This advantage may not be a gamechanger, but it's helpful for debugging purposes (if you use the proprietary Windows IDE). It's indeed quite minimal, you can think of it as the Arduino Pro Mini's little brother. Don't let the USB connector fool you, there's no USB capability here, not even FTDI; it's just for power. There's the tantalizing VUSB possibility, but the board lacks a crystal position for the necessary 12 MHz, and the DP/DM pins are hard to access. That's not to say it's not worth a try! On the backside you can see a LT1117-3.3 in SOT223, which converts the input voltage from the RAW pins (the left corners) to 3.3 V. The board can also be powered via the USB connector, but the data lines are sadly not connected anywhere. Both the input voltage and the regulated 3.3 V can be used for external circuits, they're available on the bottom header. Confusingly, the "5V" pin is directly connected to the input, there's no 5 V regulator. With USB connected, you'll of course get something quite close to 5 V.
There are two more ways to power the board, namely the pins in the bottom row, and the "3V3" pin in the programming header. It appears you can simply connect an external 3.3 V source to either of the "3V3" pins and it'll work. I was worried the LDO might not like that, but it works just fine. 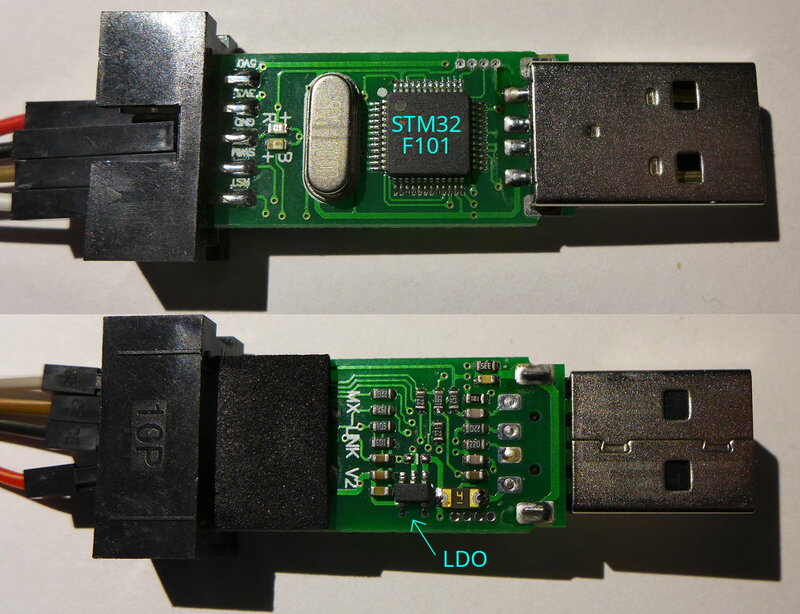 This means you can power it straight from the programmer, but be super careful with larger loads: There's a really tiny regulator in the ST-Link dongle (pics below). Easy to fry. The board has 2 LEDs, one (blue) is always on, and the other (red) can be used for your blinking. On the specimen I received, the red LED is connected to pin B5. Out of the box, the micro is loaded with a simple blinking firmware, so you can try if it's alive by just connecting it to USB. To successfully flash the STM8, you'll need (besides the STM8) an ST-Link programmer capable of SWIM (the debugging protocol the STM8 uses). Those can be purchased on eBay or AliExpress for a few dollars, so don't forget to get one while shopping for the board. They're cheap, so it might be wise to get two, in case you kill it. I managed to do that and don't even know how. A fun note: The programmer is available only because some clever hackers managed to steal the ST-Link blob from a firmware update. The dongles are essentially clones of the break-away part of Nucleo boards. A guide to setting up the dev environment on Linux & some hints about programming the STM8 can be found in Part 2. Found something wrong or have a question? You can use e-mail or hit me up at @piggo@piggo.space. Article published 2017-01-05 by Ondřej Hruška.